Hi hello! good morning to everyone. Are you searching for a perfect destination and experience an amazing cruise ship? Wow! why not try the most elegant Royal Caribbean Cruise Line. It's a perfect idea to explore and have a unique experience while you are still young. It's the most beautiful cruise ship called Oasis of the Seas. Remember life is too short so we need to experience exciting cruise ship. Royal Caribbean Oasis of the Seas is the largest and most innovative cruise ship in the industry. 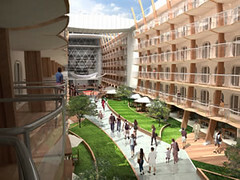 Imagine this cruise will span 16 decks, encompass 220,000 gross tons, can carry a maximum of 5,400 passengers. They have 254 Park-view balcony staterooms. It's awesome I really love it and its my dream also to experience this giant Oasis of the Seas Cruise Ship. They have the best 150 central park that you can see seasonal flower gardens, wide pathways and cute canopy trees. Also you can enjoy their chops grille, taste the great foods at Giovanni's table, central park cafe, vintages, experience the rising tide bar and you can take pictures at the parkside gallary.